The Dutch linguist Jan van Gorp (pen name Johannes Gropius Becanus, 1519-1572) believed to have proved Brabantic, the Flemish dialect spoken in the area from which he came, to be the original language spoken in Paradise. Observing Brabantic to have the highest proportion of single-syllable words compared to Hebrew, Greek and Latin, Becanus reasoned that as the first language must also have been the simplest, all languages must ultimately bederived from Brabantic. In the course of his etymological research he also drew on the idea that reversing a word’s sound reversed its semantic meaning. 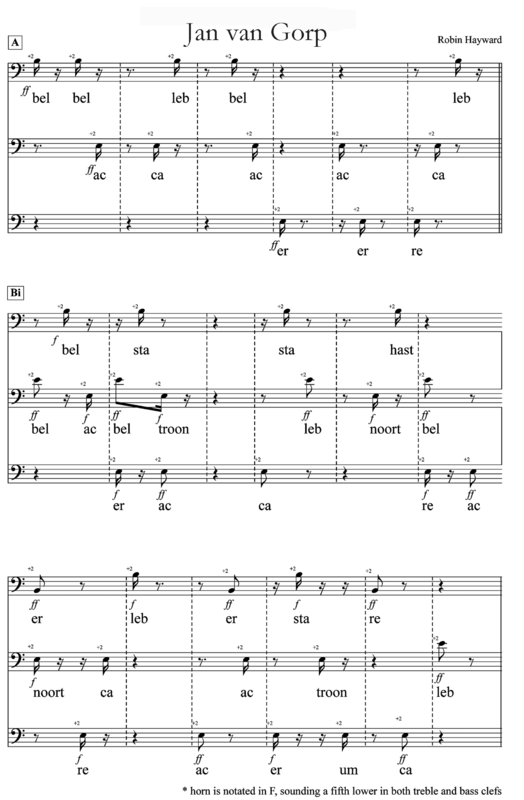 The 40-minute composition Jan van Gorp, composed by Robin Hayward in 2008, draws on the sound of thirteen such single-syllable reversible words that Becanus used to support his theories. Hocketing techniques are used to combine these syllables into longer ‘words’, together with retrograde techniques based on their reversibility. Underlying the harmonic structure of Jan van Gorp is the simultaneous use of overtone and undertone microtonal tuning. Comma clashes between the successive primes act as a metaphor for the fall from Paradise and the Confusion of Tongues. Through exploring microtonal tuning on brass instruments, and by using half-valve and muting techniques, it is possible to imitate the inflections of speech and vowel sounds. Traditional articulation is replaced by using the words’ consonants to begin and end notes.